14 January 2010 Economic Overview – global recovery continues but lacks conviction. 2 2 Strong end to 2009, but growth is well below pre-recession pace. Sources: Markit, ISM, JPMorgan. 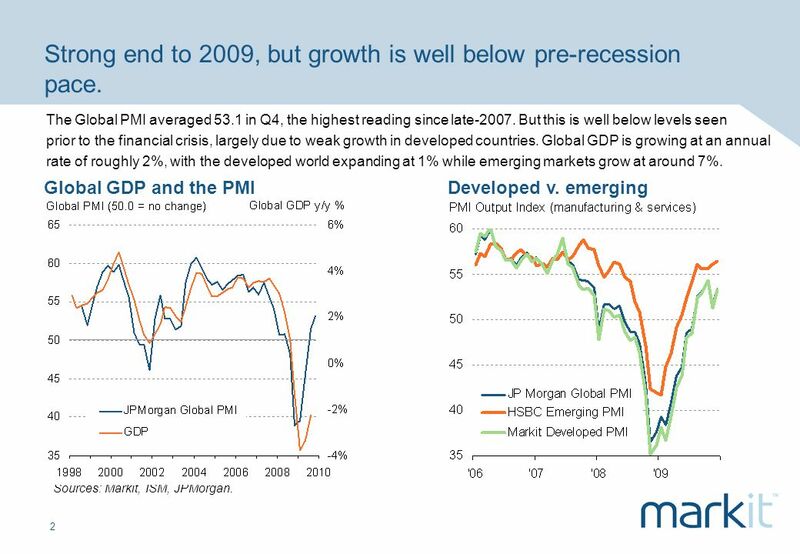 Global GDP and the PMI Developed v. emerging The Global PMI averaged 53.1 in Q4, the highest reading since late-2007. But this is well below levels seen prior to the financial crisis, largely due to weak growth in developed countries. Global GDP is growing at an annual rate of roughly 2%, with the developed world expanding at 1% while emerging markets grow at around 7%. 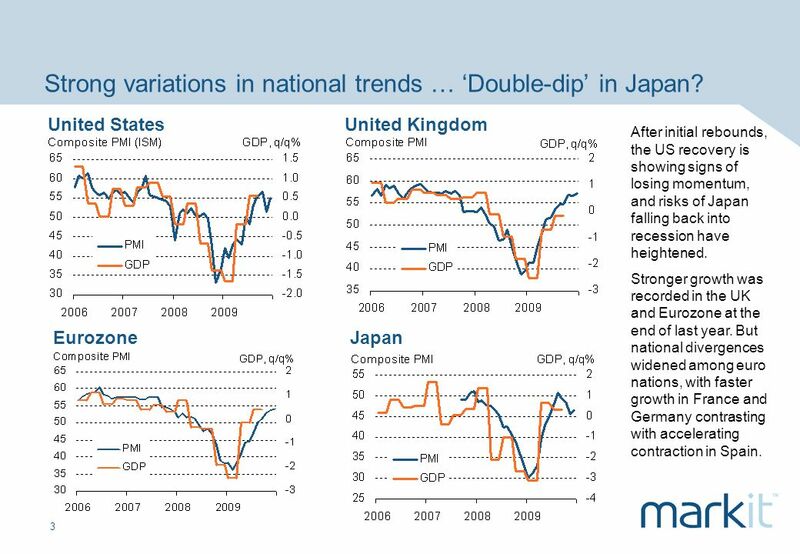 3 3 Strong variations in national trends … Double-dip in Japan? United StatesUnited Kingdom EurozoneJapan After initial rebounds, the US recovery is showing signs of losing momentum, and risks of Japan falling back into recession have heightened. Stronger growth was recorded in the UK and Eurozone at the end of last year. But national divergences widened among euro nations, with faster growth in France and Germany contrasting with accelerating contraction in Spain. 4 4 Sluggish service sector contrasts with ongoing manufacturing rebound. Manufacturing Services Sources: Markit, ISM. PMI data showed manufacturing ending 2009 on a strong note in all major economies. Service sector PMI data were less convincing, especially in Japan, where the sector continued to contract at a severe pace. 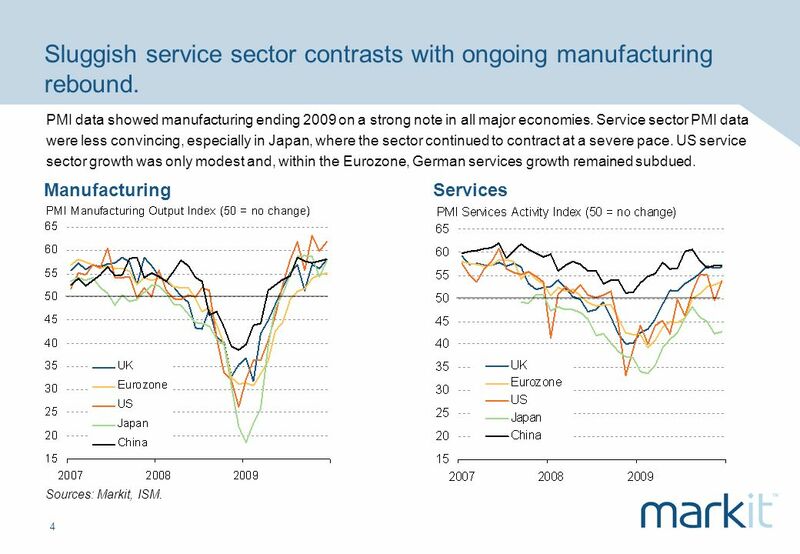 US service sector growth was only modest and, within the Eurozone, German services growth remained subdued. 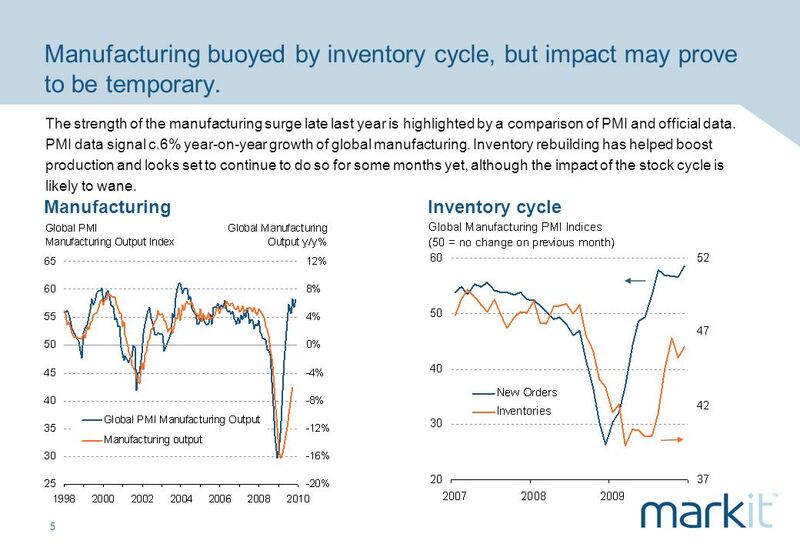 5 5 Manufacturing buoyed by inventory cycle, but impact may prove to be temporary. ManufacturingInventory cycle The strength of the manufacturing surge late last year is highlighted by a comparison of PMI and official data. PMI data signal c.6% year-on-year growth of global manufacturing. Inventory rebuilding has helped boost production and looks set to continue to do so for some months yet, although the impact of the stock cycle is likely to wane. 6 6 Labour market on a bumpy road as global recovery hits critical juncture. Employment (actual v. PMI) US non-farm payrolls Sources: Markit, ISM, Ecowin. Waning impetus from the inventory cycle needs to be offset with rising demand from other sources for a sustainable recovery. Employment therefore needs to rise to stimulate consumer markets. 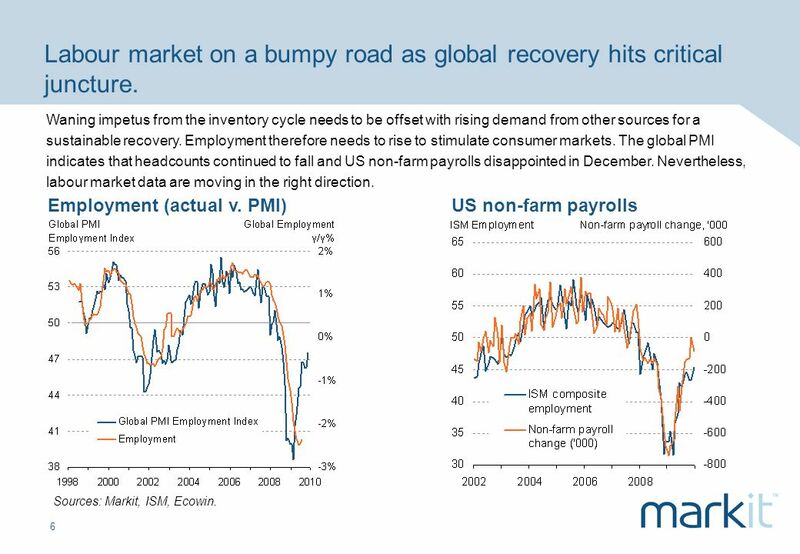 The global PMI indicates that headcounts continued to fall and US non-farm payrolls disappointed in December. Nevertheless, labour market data are moving in the right direction. 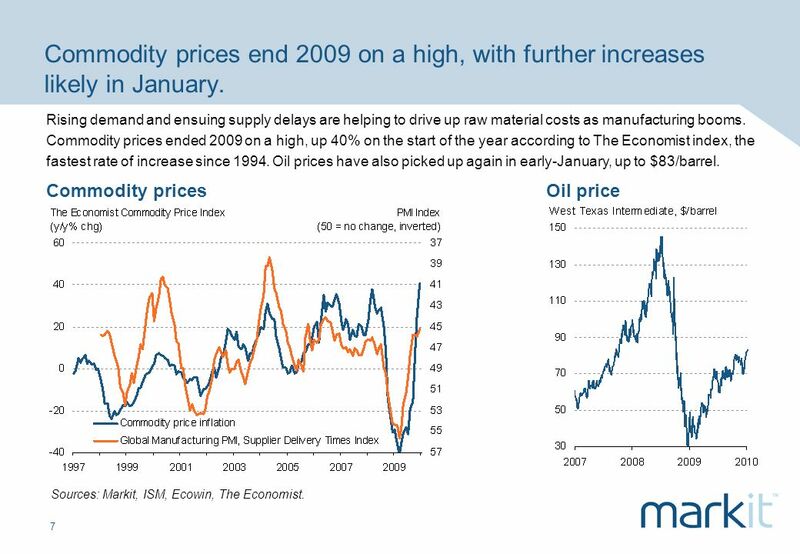 7 7 Commodity prices end 2009 on a high, with further increases likely in January. Commodity pricesOil price Sources: Markit, ISM, Ecowin, The Economist. Rising demand and ensuing supply delays are helping to drive up raw material costs as manufacturing booms. Commodity prices ended 2009 on a high, up 40% on the start of the year according to The Economist index, the fastest rate of increase since 1994. Oil prices have also picked up again in early-January, up to $83/barrel. 8 8 Long-term bond yields increase as investors worry about the combination of central bank exit strategies and rising bond issuance. 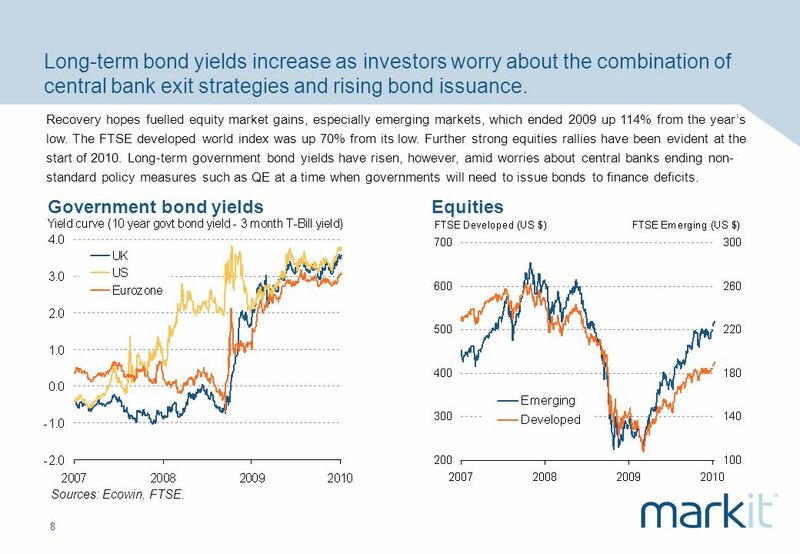 Government bond yieldsEquities Recovery hopes fuelled equity market gains, especially emerging markets, which ended 2009 up 114% from the years low. The FTSE developed world index was up 70% from its low. Further strong equities rallies have been evident at the start of 2010. Long-term government bond yields have risen, however, amid worries about central banks ending non- standard policy measures such as QE at a time when governments will need to issue bonds to finance deficits. Sources: Ecowin, FTSE. 9 9 Credit markets reflect rising fears about deficit funding. Corporate and sovereign creditDeveloped world sovereign credit Source: Markit. Concerns over government deficits in the developed world were also reflected in credit markets, according to Markits credit default swap (CDS) data. The cost of insuring western European governments against default rose above that of investment-grade companies for the first time. 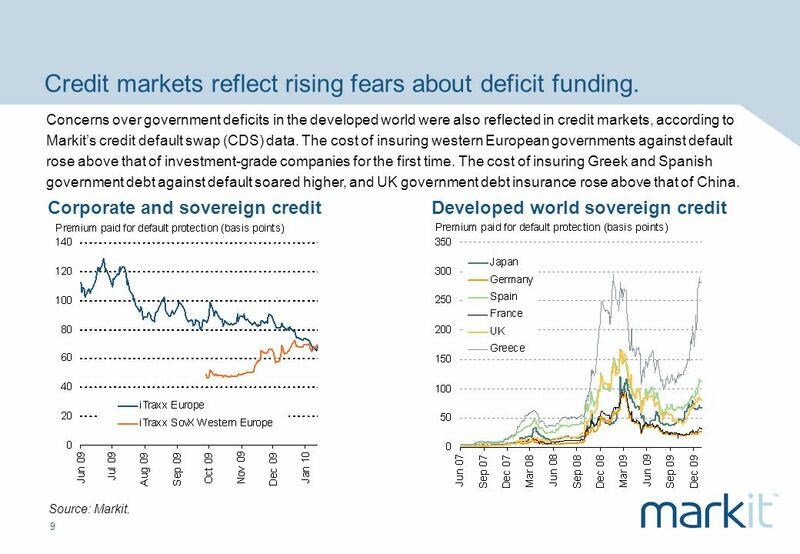 The cost of insuring Greek and Spanish government debt against default soared higher, and UK government debt insurance rose above that of China. 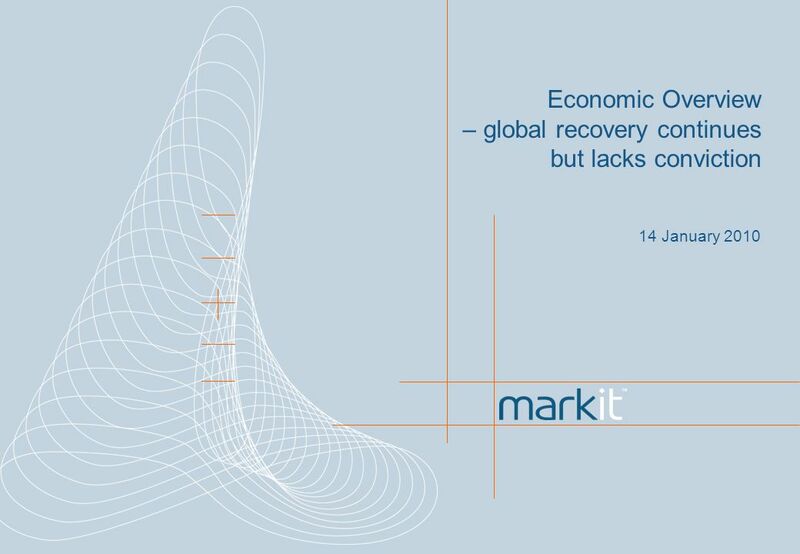 Download ppt "14 January 2010 Economic Overview – global recovery continues but lacks conviction." 11 March 2010 Economic Overview – Stay calm and carry on. WHAT IS THE GLOBAL ECONOMIC OUTLOOK? Paris, 6 May 2014 Angel Gurría, Secretary-General and Rintaro Tamaki, Deputy Secretary-General and Acting Chief Economist. Qatar Business Optimism Survey Q Presented by Dun & Bradstreet Qatar Financial Centre (QFC) Authority. Qatar Business Optimism Index Q Presented by Dun & Bradstreet Qatar Financial Centre (QFC) Authority. London’s Economic Outlook: March 2013 Gordon Douglass GLA Economics. John Rose Chief Economist Financial Services The Economic Impact of the Late Night Economy June 28, 2012 The Economic Impact of the Late Night Economy. Barry Naisbitt Economic Analysis Trends in the Economy 30 th September 2010, London United Kingdom.